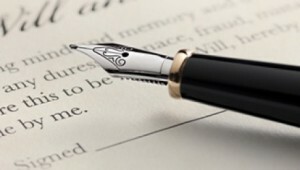 A Will is generally a formal written and signed statement, which provides for the distribution of a person’s property and assets, to take effect on that person’s death. A significant number of persons who die in Australia each year, do so without having left a Will. Many Wills drawn up during a person’s lifetime do not reflect the testator’s current wishes. Many people incorrectly believe that Wills are necessary only for the wealthy. Making a Will is not an expensive process. Your assets may be worth more than you realise. Making a Will is the only way to ensure that a lifetime’s work is passed on to the people you choose. It provides security for those who are close to you and for those you are responsible for, and may avoid unnecessary difficulties upon your death. Your Will may be used to provide for the guardians of your children (under 18 year olds) and to arrange for their maintenance and education. Should you die without a Will (intestate) your estate may be divided according to a Government formula (the laws of intestacy) – a formula that may not reflect your wishes, and which may cause undue hardship, cost and delay for your family. Making a Will is a specialised task, often requiring consideration of complex financial, legal and tax issues to ensure that your estate is distributed in accordance with your wishes.